of amber and forbidden woods "
Its style is casual and romantic, perfect for a night out on the town! It is light and fresh, I can't stand when perfume is too strong. It fades quite nicely on my skin, although the dry-down scent is not that distinct anymore, I love the smell. And to be quite honest, I'm in love with the heart-shaped amulet bottle. The cute bejeweled crown on top puts a nice touch on the perfume as well. Of course this fabulous perfume comes in a gift set as well. Makes a great present for any occasion! 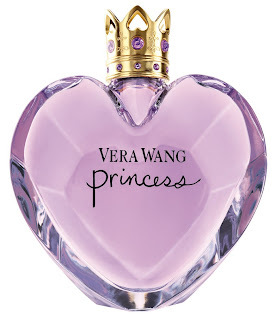 You can find Vera Wang Princess Perfume at stores such as Sephora, Macys, Nordstrom, and of course Vera Wang. You can also follow on Facebook. I received product for the purpose of this review only. All opinions are my own. No monetary compensation was received for this post.